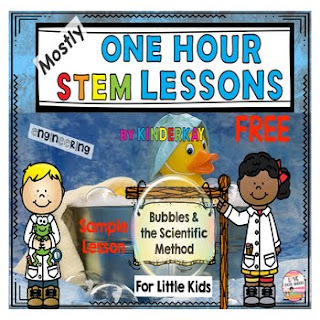 In this FREE sample resource, children use their love of bubbles to investigate and gain practice using the scientific method. Children will have the opportunity to compare commercial bubble solution to ones that they create themselves. They will be prompted to ask questions, form a hypothesis, create an experiment, draw conclusions, and share their results. A teacher read aloud, teacher instructions, and a student recording sheet are included. Most of the science activities in these ONE HOUR STEM LESSONS can be taught and finished in one hour, but there are a few that require more time. There may be some activities that are started in the morning and re-visited in the afternoon or on another day. Most lessons offer more than one STEM activity. The one hour format includes an introduction, explanation, and one activity. If you do ALL the activities in a day, they will take more than one hour OR another activity can be started and completed on a subsequent day. Teacher read aloud pages, background information, supply lists, and STEM activities appropriate for young children are included with each section.